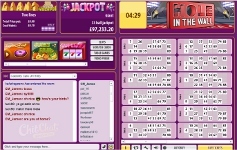 ChitChat Bingo is one of the oldest online bingo rooms in the UK bingo market. Each week there are over £1 Million pounds paid out in winnings to players of this bingo room. With daily guaranteed and progressive jackpots – ChitChat Bingo is one of the most rewarding bingo rooms you will find! ChitChat has a selection of 75 and 90 ball bingo, but another cool feature are its daily live caller bingo sessions where you can interact with the live caller bingo host. Other cool feature are the Prebuy bingo ticket tool, which enables you to win without login into your bingo account. This bingo room is non download and its website is amongst the easiest to navigate, with clear labels on the number of players, jackpot sizes and player balls away from the jackpot and prize. Every month ChitChat Bingo hosts exclusive bingo promotions to its players, which quite frankly are amongst the craziest in the market. In the past couple of months we have seen this bingo room giveaway VIP tickets to see Take That and Peter Kay, Posh afternoon teas, yearly theme park tickets. Best of all this is a fair play site where every bingo player has a chance of winning top notch prizes! Finally as you would expect from a top bingo room, ChitChat comes equipped with some of the best slots and mini games for you to play. These include top tittles such as Rainbow Riches, Cashino and Elvis Strike! USE BONUS CODE 3FREE and get £3 free on activation of email! £80,000 in guaranteed bingo jackpots every month! ChitChat Bingo is full of value offering daily £1000 guaranteed bingo jackpots, plus every Thursday in their Bingo Cafe room – ChitChat hosts a whooping £5000 guaranteed jackpot. Plus on the last Wednesday of every month ChitChat hosts a spectacular £10,000 monster guaranteed bingo room – this adds up to a total of more than £80,000 in added value for its customers!